BP was just handed $4.5 billion in fines and penalties, along with the indictment of a vice-president and two on-site supervisors for manslaughter, all as a result of the Deepwater Horizon oil spill that dumped 4 million barrels of oil into the Gulf of Mexico. This is by far the largest corporate criminal fine ever ordered by a US Court. It comes only months after the US Supreme Court upheld the verdict of an Ecuadoran Court, adding to the amount BP owes that country – now totaling $2 billion, for damage to the environment among other allegations. These are simply a continuation of the management approach that led to the 2005 Texas Oil Refinery Explosion and the 2006 bursting of the Prudhoe pipeline that poured 200,000 gallons of crude into the pristine Alaskan tundra. According to a post by Kirsten Korosec on CBS Money Watch two years ago, all these environmentally damaging events arose from a corporate culture focused on endlessly cutting maintenance costs and safety expenditures while rewarding executives for doing so. The only corporate criminal fines anywhere near as high as the BP penalty are all against pharmaceutical giants for producing drugs with devastating side effects. This is as it should be because oil is the drug to which the economies of the Western World are addicted, and the side effects are all too well known. Currently facilities in New Zealand’s Bay of Plenty and Taylor Energy Wells are still spilling from minor leaks. The leak in Tauranga started October 5, 2011, but the one in the Gulf has been leaking since September 16, 2004, slowly dumping 800 barrels over the years. No it isn’t much but as we said, oil and water don’t mix and these are just in addition to the 4 million from Deepwater Horizon. Wikipedia lists 11 spills around the world in 2011, including 102 barrels of petroleum dumped into the Yellowstone River in Billings, near America’s first National Park and most treasured mainland wilderness. Another 13 incidents globally in 2010 included the Xianxing Port Oil Spill that dumped 660,000 barrels into China’s Yellow Sea. Nevertheless if you look at the top spills ever, BP’s misadventures are dwarfed by the Gulf Oil Spills that occurred during the 1991 Gulf War, according to gcaptain.com. To spite US opposition, the Iraqi Army destroyed tankers, oil terminals, and wells in Kuwait, causing the release of about 900,000,000 barrels of oil, creating the largest oil spill in history. In 1976, the oil tanker Argo Merchant ran aground on the Nantucket Shoals, 29 nautical miles from Nantucket Island, MA. In six short days, the vessel broke apart, spilling its cargo of 7.7 million gallons of fuel oil into the North Atlantic. Tampa Bay suffered a similar malaise in 1993, when a collision of ships including the barge Bouchard 155, the freighter Balsa 37, and the barge Ocean 255 ran into each other. The Bouchard 155 spilled an estimated 336,000 gallons of fuel oil. In 1979, a collision occurred between the tanker Burmah Agate and the freighter Mimosa, southeast of the Galveston entrance in the Gulf of Mexico. A resulting explosion and fire on the Burmah Agate burned for nine weeks straight. About 7.8 million gallons were consumed by the conflagration with an estimated 2.6 million gallons of oil were released into the Gulf. Which brings us to the ill-fated Exxon Valdez that ran aground on Bligh Reef in Prince William Sound on March 24, 1989. In an effort to avoid ice, the supertanker was navigating outside normal shipping lanes. 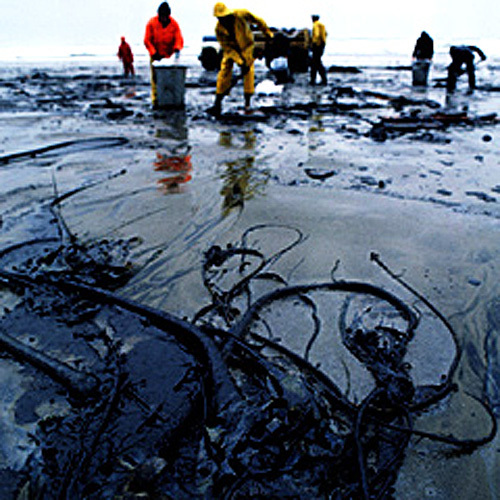 It managed to spill 10.8 million gallons of oil out of its 53 million gallon capacity into the delicate marine environment, damaging over 1,100 miles of Alaskan coastline and still causing dilatory effects to this day. State and Federal agencies continue to monitor the aftermath of this spill, which was the largest oil spill in U.S. history until the 2010 BP oilrig fiasco. No we can’t stop using oil cold turkey and we are not even trying to suggest we do so. What we’d like to see is corporate and environmental responsibility sufficient to see that the oil we need is not dumped into the world’s oceans. It is a remarkable testament to the resilience of nature that all these spills have not killed the oceans outright. If we stop spilling oil, then we just need to get the plastic content of the ocean down and maybe nature will forgive us all, instead of fighting back with rising coastlines and debilitating hurricanes. Remember, a pendulum can only be pushed so far until it swings back at you. That's the crux of it really, we don't value energy as much as we should. We're sloppy, don't buy a valve that could have 4.5 million barrels of crude, hiring a drunkard of a captain who crash his tanker in Alaska. We need to value our energy more and diversify, instead of wasting it and putting all our eggs in one basket. Now let's see if BP actually pays up. Doubtful. Well they can afford to pay. Their 2011 PROFITS were $9.3 Billion. That's over $2,000 for every barrel they dumped into the Gulf. Yes, they sure can. These companies were the only companies grossing in huge profits in the middle of the recession, but when I look back, they rarely, if ever pay their fines. Meanwhile, my taxes go to give them "subsidies", even in the midst of a global economic downturn. So, sure they can pay, but the question is, will they? If history is anything to judge by, then I say the chances are very slim.